Ahh. It’s good to be on Summer Vacation. 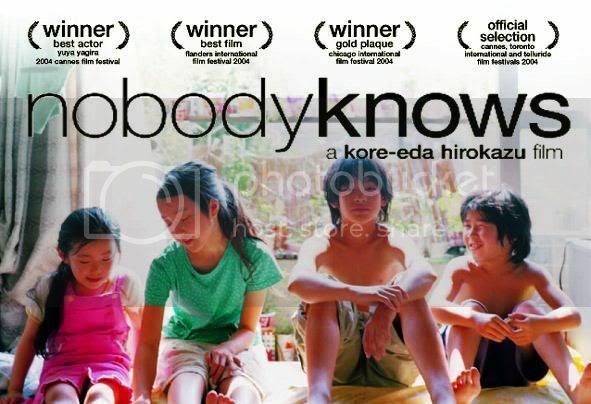 Nobody Knows is based off a real event that occurred in Japan tagged the “affair of the four abandoned children of Sugamo.” Although the story is fictional, it gives a bases of the actual event; the movie covers the story of 4 children who all have different fathers and their survival after abandonment. Only the oldest boy Akira (Yuya Yagira) was registered at birth, so when they move into the new apartment, the landlord only knows of the existence of him and the mother, forcing the other 3 children to be sneaked in. Eventually, their mother ends up leaving a few hundred dollars and abandoning the 4 children in the apartment, leaving Akira, who is only 12 at the time, to fend for his siblings. Slow paced and heartbreaking, this movie truly captures the sense of abandonment and heart of a child. Unless you have the patience to watch this movie, you won’t be able to grasp the beauty of it and the resilience of the children. It’s a simple and realistic film which doesn’t have any high and exciting moments, but definitely not boring since the cinematography and actors/actresses do an amazing job of portraying these light-hearted children who seem to be stuck in limbo. To say the least, this film is warming yet heart wrenching. I really don’t have anything bad to say about this movie besides it being quite slow and long. Overall though, a VERY well made movie, but definitely not for everyone. Should you watch it? If you have the patience and the time, it’s a lovely movie. Wiki: Affair of the four abandoned children of Sugamo. Shisso: scroll down to where it says “if you are interested in the real story that happened back in 1988” to read about the event. Eventually, some how, and some way! I’m going to have to watch these movies. No more watching movie trailers. Thanks for the b-day wish!